For a long time, Austrian macro had a unique selling point in what might be called the ‘money matters’ view: referring to the notion that changes in the money supply by their very nature can never be said to be neutral. Yeager (1997) and Horwitz (2000) describe the Austrian stance as a “fluttering veil”. On the one hand, it incorporates the belief that prosperity cannot be generated through an expansion of the money supply in the long-run (long-run neutrality of money). On the other hand, changes in the money supply have real effects (short-run non-neutrality). This proposition can be traced back to the works of classical economists such as Hume (1970), Mill (1909), Cairnes (1873), and Cantillon (1755). [i] In his essay on economic theory, Cantillon (1755) points out that an expansion of the money supply necessarily entails distributional effects as first receivers of the newly created money benefit compared to those ones further down the line. In a previous post, Andreas refers to George Selgin’s recent discussion of the place of fractional reserve banking in the Austrian Business Cycle Theory (ABCT). There, Selgin takes a swipe at the monetary pillar of the ABCT. According to the Austrian model, fractional reserve banking is inclined to create money out of “thin air” and, therewith, admits investment spending in excess of “voluntary saving”. This imbalance, allegedly induced by a decline in reserve ratios, is reflected in a Wicksellian interest rate gap, which is supposed to impact prices and the allocation in a systematic way (the real pillar of the ABCT). Selgin argues that fractional reserve banking does not account for the Austrian business cycle, and Andreas expresses sympathy for this view. Austrian accounts of the money-creation process often exaggerate the ability of fractional reserve banks to create money “out of thin air,” even while sticking to a fixed reserve ratio, by looking at only one part of the bank money creation process. Actually, it isn’t, for the simple reason that, more often than not, a deposit made at one bank involves a corresponding withdrawal of funds from another bank, as when the deposited sum takes the form of a check. Check this out at Liberty Matters. 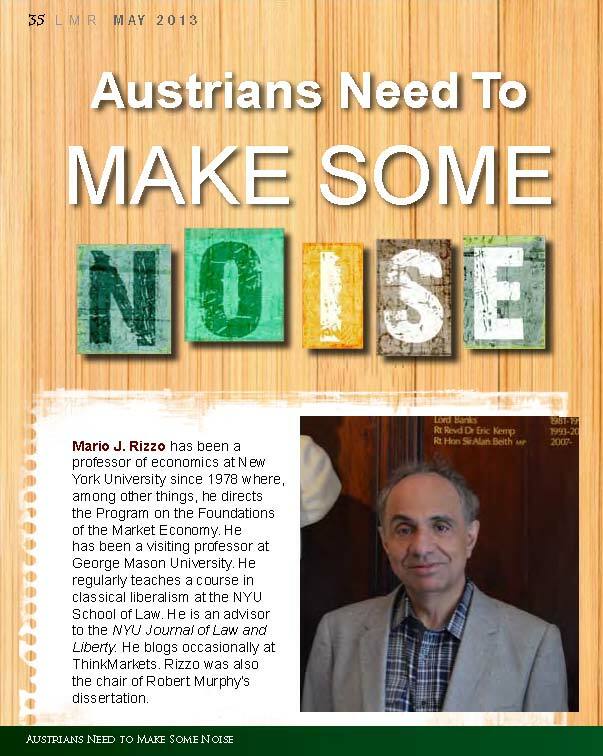 I am grateful for the valuable comments by Peter Klein and Joseph Salerno at the Ludwig von Mises Institute to my previous post on Friedrich von Wieser and the historiography of the Austrian School. Some lines of clarification seem necessary. The European Central Bank will increase the overall volume of its bond purchase program to 2,550,000,000,000 euros by September 2018. The main refinancing rate will remain at zero. Mario Draghi has stressed that this policy shall continue until inflation picks up sustainably (which is unlikely to happen in the foreseeable future). The works of Friedrich August von Hayek (1931, 1944, 1976) help to explain why the tremendous monetary expansion is increasingly causing growing economic and political instability in Europe. Should Central Banks Lean Against the Wind? The pre-crisis Jackson Hole Consensus view on how to take asset market developments into account in monetary policy can be summarized as follows: Because it is hard to spot bubbles in asset markets with certainty ex-ante, central bankers should not lean against the wind when there seems to be a boom in financial markets (as long as the inflation rate does not pick up). However, as a rapid fall in asset prices can pull the real economy into the maelstrom of crisis, monetary policy should react decisively when a bubble bursts and “clean up the mess” to prevent spillovers to the real economy. 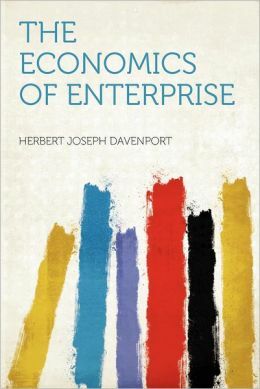 This is the final installment of my comments at Liberty Matters in the discussion of Israel Kirzner’s theory of entrepreneurship and its interpretation by Peter Boettke. The annual meeting of the Society for the Development of Austrian Economics will be held during the Southern Economics Association meetings in Tampa, FL at the Tampa Marriott Waterside Hotel and Marina, November 17-19, 2017 (Friday to Sunday; more information can be found here: https://www.southerneconomic.org/conference/). 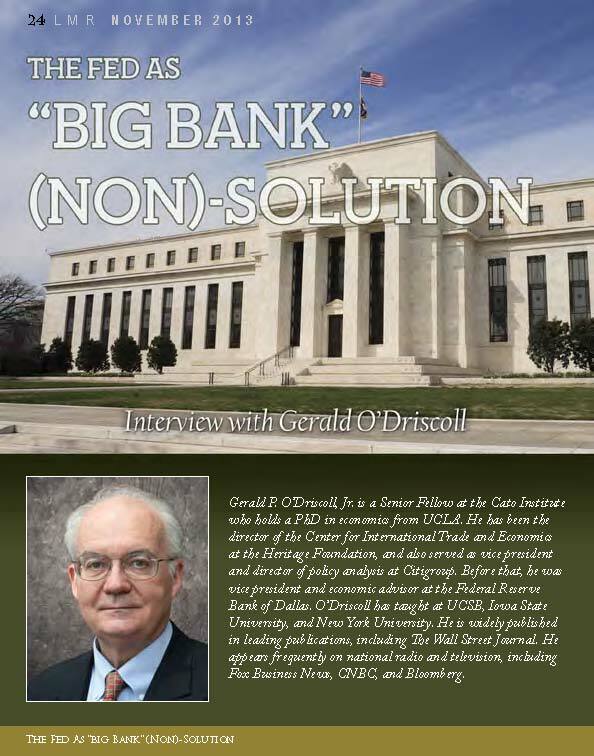 I am happy to post a very interesting interview with my long-time friend and Cato senior fellow, Jerry O’Driscoll. As readers of ThinkMarkets know, Jerry frequently contributes to this blog. This is from the Lara-Murphy Report. The entire report can be accessed immediately below. The interview with O’Driscoll begins at page 24. 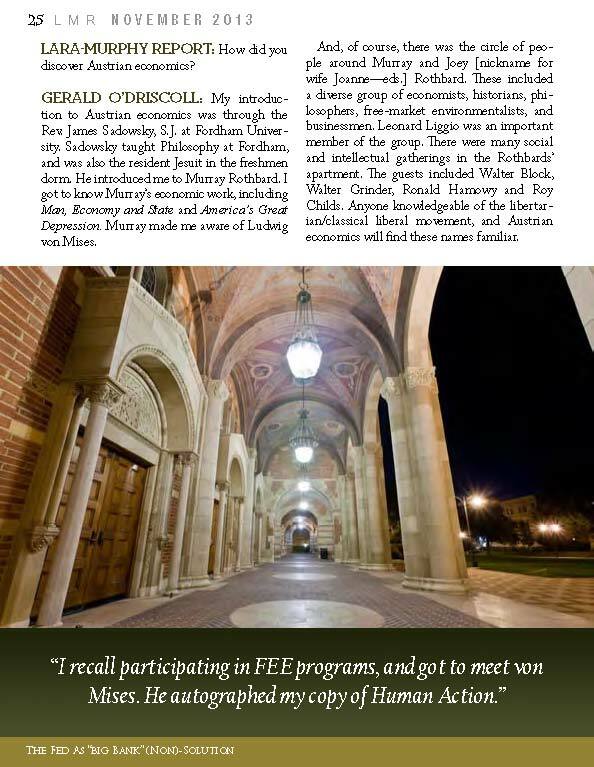 Some readers may be interested in this interview in the May issue of the Lara Murphy Report. It contains some details of my early days as an Austrian economist or, at least, as a budding one. LMR — Rizzo Interview pp. 35 -41. The next phase in my (now our, as I’ve taken on a colleague) project of thinking through Dan Klein’s Knowledge and Coordination is to see how his ideas might be used to help describe business cycle theories and demonstrate commonalities they share. Note: the point of the present exercise is simply to try to describe an existing business cycle theory in Kleinian terms, not to improve upon it or argue for its accuracy. In his book Knowledge and Coordination, Daniel Klein distinguishes between mutual coordination and concatenate coordination. Mutual coordination is coordination which people intend: you and I plan to meet for lunch, or several con artists devise a scheme to defraud an elderly widow of her fortune. Concatenate coordination is coordination that is pleasing to an impartial observer: one of Klein’s examples is a room designed with a harmonious combination of colors, shapes, and so on. Monday past at our colloquium Andreas Hoffman presented a fascinating paper attempting to depict Austrian Business Cycle Theory as a special case of a more general business cycle theory based upon Hayek’s later work on spontaneous orders. Hoffman’s general idea (I won’t do it justice in this brief summary, so please have a look at the paper) is that business cycles occur when a “displacement” creates a situation in which people are uncertain how to make “adjustments” to move back closer to equilibrium. The period during which people are groping about for what to do creates the slump, and the upturn comes, of course, once they have gotten the hang of the new situation. Jeffrey Friedman and Wladimir Kraus have a new book out, Engineering the Financial Crisis, (Univ. Penn Press) that grew out of research that first appeared in Critical Review back in 2009 on the “Causes of the Crisis.” Friedman’s lead article in that issue did an excellent job of providing a detailed but readable description of the institutional setting of the crisis and an account of the complex events, domestic and international, that led to it. I’ve only skimmed the book, but it appears offer a similar kind of useful description and analysis of these and many other events surrounding the crisis. What distinguishes this book, and what may be of particular interest to readers of this blog, is it’s explicitly Austrian perspective on the role of ignorance, in the private but especially the public sector, as the analytical starting point of the crisis. The meta-mistake that economists make in ignoring ignorance (or in reducing it to “rational” or deliberate ignorance or to “asymmetric information,” where one party does know the truth) is suggestive, we think, of the problems that modern democracy faces: If economists are our most important advisers, but their worldviews have no place for genuine human error, we are in deep trouble (151). A rationalist constructivist hubris led public authorities to create a “hybrid capitalism” that incited entrepreneurs to ever riskier investments, the consequences of which no one could foresee though they perhaps might have imagined. The book’s title Engineering the Financial Crisis captures that idea well.